Bright and early on a Tuesday morning at the end of last month, Eileen and I met for coffee with Andrew Mullaney, who is Dudley’s first ever Business Connector, seconded from Lloyds Bank to Business in the Community’s Business Connectors programme. I think we’ve struck gold here in Dudley because Andrew is not only talented, and experienced in business, but also hugely passionate about Dudley and driven by a mission to make a sustainable, lasting difference in the work that he does. In his first five weeks in his new role Andrew had already made an astonishing number of connections and was working incredibly energetically as a network weaver (see video below), actively creating connections between people and organisations who hadn’t previously known about each other, or worked together. In the weeks since we met him, Andrew has been just brilliant at connecting us with helpful people and organisations, and has very kindly been promoting Dudley Volunteer Centre and Dudley CVS in all sorts of things he’s been involved in. If you want to use and grow your networks to make positive change in Dudley I’d recommend arranging to meet Andrew for a coffee. Some great connections are guaranteed! 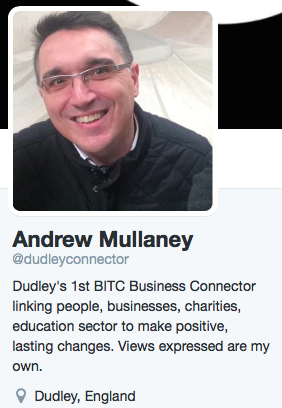 You can connect with Andrew on twitter @dudleyconnector, by email andrew.mullaney@bitcconnect.org or give him a call on 07834945827. For more on network weaving, check out June Holley’s work, and the video below. What better time to let you know about events and support for local social entrepreneurs? Local people and organisations are invited to run activities during Global Entrepreneurship Week, and one of our local organisations, the Beacon Centre for the Blind have signed up. They are hosting an event this Thursday. The Opportunities for Social Enterprise, Investment and Impact conference is a West Midlands wide event, and places for people who live or work in Dudley borough have kindly been subsidised by Dudley Council, so are free. Just hop over to Eventbrite to register. A different kind of event coming up for social enterprises and social entrepreneurs in Dudley borough has been organised by the local Synergy network (@synergy_dudley on twitter). On Friday 27 November they are hosting a marketplace event at Brierley Hill Civic Hall. Doors open at 9am, and the event kicks off at 9.30am with talks from the Leader of Dudley Council, our Chief Officer Andy Gray, along with other Synergy network leads and local MPs. A panel discussion leads into a free lunch at 12.30pm and the afternoon marketplace will be open until 4pm. And finally, don’t forget that we offer free support to social entrepreneurs and social enterprises in Dudley borough. I recently interviewed Becky Pickin about the support Dudley CVS provide. Have a listen to the short clip to hear about how we help people – from the first step on the journey of understanding what a social enterprise is, to developing ideas and undertaking market research, to setting up governance. I also asked Becky about Synergy, so if you’d like to hear more about what it is, just click the play button. Do you have any questions about social enterprise? Are there any local social entrepreneurs you’d like to see featured on our blog? Leave us a comment or get in touch with us on twitter or Facebook. How can we improve the diversity of trustee boards? The Trustees’ Week website has lots of useful information about becoming a trustee, recruiting trustees and topics related to running a charity. 43.4% of trustees are female, and 56% are male. (Each trustee is counted only once, though some are trustees for more than one charity. The figure for female trustees should be treated as a minimum as only those whose titles are certainly female are included). Spotlight on Dudley CVS Trustee, Alison Sayer. Earlier this year, (July 2015) I had the pleasure of interviewing Alison Sayer, Chief Executive Officer of Halas Homes in Halesowen (www.halashomes.co.uk), for an article in the Dudley CVS Echo newsletter. Alison has been a Dudley CVS Board member since 2013, bringing with her a particular expertise in Human Resources and seemingly boundless energy. Coming from a background in hospitality, Alison refers to the residents and the people who use the day centre as ‘customers.’ “It’s really important to find out as much as possible about our customers so that we can design services and activities that provide the best possible outcomes for them,” she said. While Alison is clearly passionate about the work of Halas Homes, she is not so keen to be in the spotlight, preferring instead to conduct a guided tour of the Halas Homes premises and let some of the residents, members of staff and volunteers do the talking. In the kitchen, we met Ken, who has been a Halas Homes resident for 39 years. While drying dishes, Ken spoke about how much he had enjoyed installing bird boxes in Halesowen earlier this year as part of Halesowen in Bloom. In the day centre, volunteer Glynis Miles was leading an activity called Sing and Sign. The singing part was a boisterous rendition of “I never promised you a rose garden.” The signing part involved two teams of residents and visitors taking part in a highly animated and competitive version of charades. Outside, the allotment site was awash with produce ready to be picked and prepared in the on-site kitchen. Also outside, Mark Stevens, an ‘invaluable’ Halas Homes volunteer for over four years, was busy cleaning one of the small mini-buses. “I started out as a volunteer here at Halas Homes, then I became a part-time employee, but I still do voluntary time as well because I like to help out in any way I can, such as running errands to pick up prescriptions. But most of all I enjoy helping with activities for our customers,” said Mark. Alison also walked me the Coffee Cups Café in nearby Thornhill Road, where volunteer helper, Suzy Bury, had been preparing vegetable soup, something she was clearly very proud of. The café, which was acquired by Halas Homes in 2012, plays host to nearly 300 customers each week, providing home-made fayre at cost plus a small profit margin.